Over the Easter Bank Holiday I visited an exhibition called Eastbourne Ancestors: A story of life from the bones of the past, which is on in Eastbourne until autumn. Central to the exhibition are skeletons dating back as far as Neolithic times that have been investigated through archaeological digs, scientific analysis and 3D reconstruction. 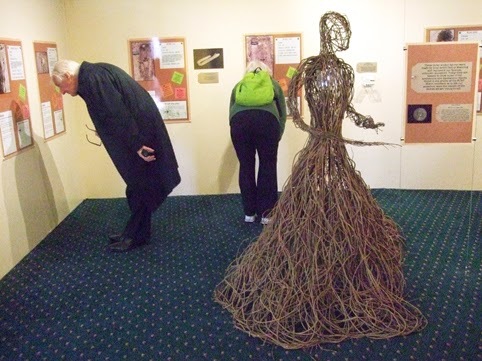 The most impressive skeleton is that of the "Beachy Head lady" (pictured right). Discovered at Eastbourne's most famous cliff, this woman lived in the local area during Roman times. Scientists discovered that she was of African origins and may have been the wife, daughter or servant of a high-ranking Roman officer. 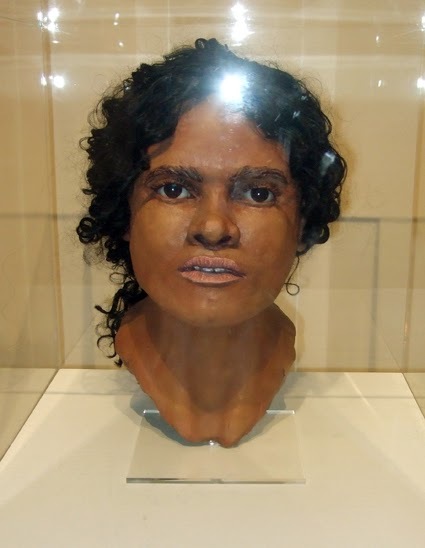 In the exhibition, her almost complete skeleton is displayed next to a reconstruction of her face (pictured below left) and details of what has been learnt about her. I found it fascinating. However, I had been in two minds about whether to visit the event at all. I was concerned I might find it a bit ghoulish. 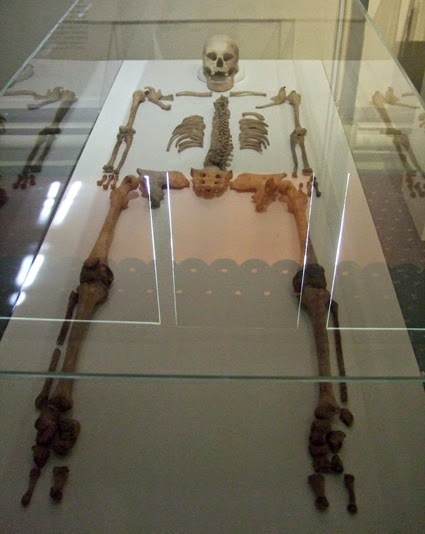 Many pagans are very much opposed to archaeological exhumations of human remains, or at least think that the bones should be reburied after examination in a manner and location as close as possible to that in which they were originally interred. The theory is that when that person died, their friends and relatives gave them the funeral they wanted and we should respect those wishes hundreds or even thousands of years later. To do otherwise is disrespectful. But, I have to say, despite my misgivings I didn't personally find Eastbourne Ancestors to be at all upsetting. It seemed to me that a great deal of respect was being paid to the bones on display. The way the skeletons were laid out and the stories that were explained alongside them about how our ancestors lived seemed more reverential than intended to dishonour them in any way. If scientists in the future can learn from my remains after I am long dead, I don't think I would mind. But what would Beachy Head lady have thought? Unless we contact her spirit, journey to the realm of the ancestors, or discover time travel, and are able to ask her, I guess we will never know. Perhaps some medium, shaman or future time-traveller should attempt that, but my personal feeling is that she would, perhaps, like her story to be told. Maybe she would like her descendants, both in England and in Africa, to learn what happened to her and to pay their much-belated respects to a woman who died young and a long way from her own ancestors. Interesting. It struck me that I'm not aware of any mediums who claim to be able to channel spirits from this far back in time. Why is this? Perhaps a medium or modern shaman could give it a go, although please not the tiresome Ross Heaven or Simon Buxton! My personal belief is that the spirit of this lady, if not currently reincarnated and experiencing another adventure, will have a much more enlightened view of the process of life and death than those twee and tiresome types who have nothing better to do than claiming to be outraged on behalf of others they neither knew nor understood. Jayne - love you comments!